Teeth stain… It’s an unpleasant fact and no matter how well you take care of your teeth, they’re going to get darker as you age. The food we eat and our daily habits will stain the dentin of our teeth, however everybody wants a beautiful smile. Some stains, from things like coffee, soft drinks and dark colored foods develop relatively evenly over all of your teeth and tend to accumulate over time. Other stains, such as those developed from smoking cigarettes, develop as unattractive, uneven patches on your teeth. Your teeth can even grow darker in color due to side effects of certain medications and antibiotics. Fortunately, you can battle any and all of these staining factors with BleachBright’s amazing whitening products. Why not try the most affordable, effective method available for brightening your smile today? Read on to find out more about how our products work and what they can do for you. 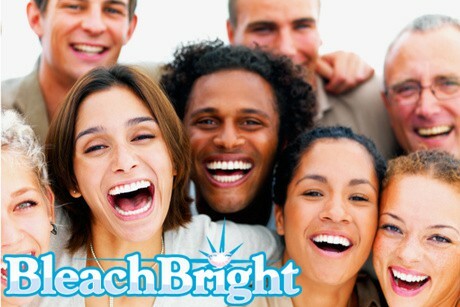 BleachBright is here to make sure that you get and maintain a whiter smile. Our cosmetic teeth whitening (also known as “bleaching”) products are the best in the industry. The BleachBright revolutionary teeth whitening system will give you the whiter smile you want in as little as 15 minutes. No time to come in and see us? That’s no problem! Just whiten your teeth at home. We know that people live busy lives, so we offer at-home and maintenance products for your busy schedule. Whatever your needs are, we’ll find the products and services that are right for you. So, what are you waiting for? Call us now to get your new sparkly white smile! Remember, if you’re not whitening, then you’re yellowing… So light up your smile today! The BleachBright system stands out above the rest for fast and effective teeth whitening. The BleachBright L.E.D. Whitening Kit and BB-Cool Advanced III light system combines speed and convenience with amazing results. In just one 15-minute session, you’ll see your teeth lighten 2-8 shades! Come in today and see the difference for yourself! With this method, you will receive a pre-filled tray (which looks a lot like a mouth guard). It is filled with whitening gel and is placed it your mouth long enough for the gel to lighten your teeth. This usually takes about 15-20 minutes. Bluminerals™ enamel boosting gel seals in your whitened teeth and protects them against future stains. With this 10-minute ad-on treatment, you can increase your enamel strength and protect your teeth against damage and yellowing. Think of Bluminerals™ as the finishing, protective touch for your brilliant new smile. You wouldn’t wash your car without waxing it, would you? And you wouldn’t shampoo your hair without applying a hydrating conditioner, right? Well, don’t leave your newly whitened teeth unprotected either. After you whiten, insure your smile with Bluminerals™ by BleachBright! Peroxide gels can cause some people to experience tooth sensitivity. Bluminerals™ has potassium nitrate which eases sensitivity. Every time you eat or drink, you weaken the enamel of your teeth. The sodium fluoride in Bluminerals™ helps strengthen your teeth enamel. 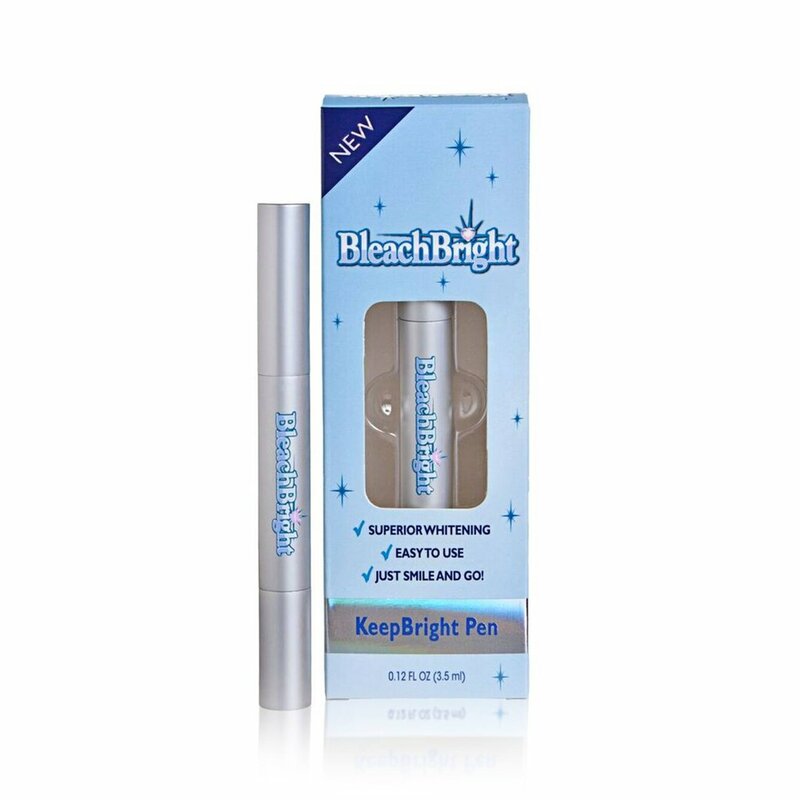 The KeepBright Pen lets you easily maintain your smile, fitting in your pocket, for on-the-go teeth whitening. Use it after meals to remove new stains from food and drinks before they have a chance to set. Just twist the bottom of the pen until you see gel come out of the tip. Apply a thin layer of gel to your teeth. Allow 30 seconds for it to dry, and you’ll be ready to light up any room with your pearly whites!